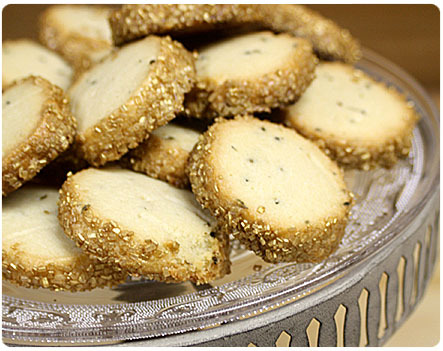 Light and buttery with a hint of “what am I tasting?”, these cookies are elegant enough for a bridal shower or holiday party but simple to make. I was inspired by Martha Stewart‘s Rosemary Butter Cookies but have been wanting to test out a new recipe with lavender. 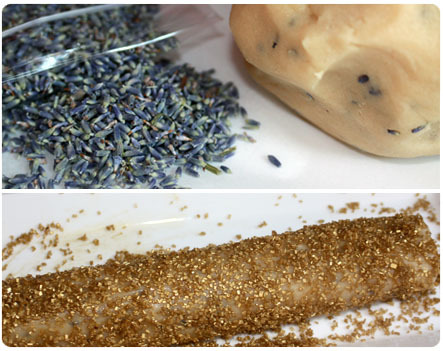 With the lavender you not only get the usual aroma of cookies baking, but your house smells like a spa too! Since this Christmas I’m obsessed with anything sparkly, I used gold sanding sugar to “gild” the edges. You can find the sugar in a variety of colors at Michaels and the lavender at most spice stores or natural food markets. Preheat oven to 375. Beat butter and sugar until fluffy. Beat in whole egg and vanilla. Add salt and flour, beating flour in one cup at a time until well combined (dough will appear crumbly). Add dried lavender and mix by hand with a spoon or spatula. Divide dough in half and place each on a medium sized piece of parchment paper. Roll dough into a log, about 1 1/2 inch in diameter. Place each log on the edge of the parchment and roll it the paper around the log. Freeze logs for 1 hour. Unwrap the log from the parchment and place the parchment on a cookie sheet. Use a pastry brush to brush frozen logs with egg white. Pour sanding sugar onto a plate and roll dough in sugar, using your fingers to cover the log evenly. Slice log into 1/4 inch thick rounds and place on cookie sheet. Bake for 16-20 min. I wasn’t sure I would like the lavender however, the cookies were beautiful and delicious. These cookies look to beautiful to eat! This would be a great gift to give on a keepsake platter. Would someone bring a few of these over for me? Oh my goodness – these look absolutely amazing! 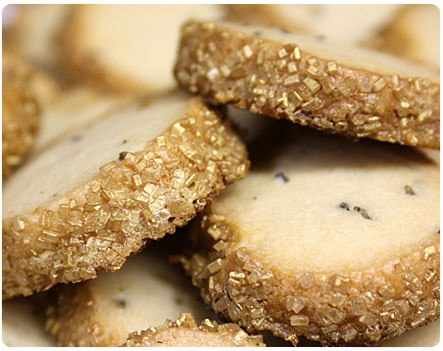 I love Rosemary cookies like these – posted SL’s recipe yesterday. I’m hosting an online Christmas Cookie Exchange on my blog today with a GREAT giveaway for everyone who participates. You can enter up to three cookies. I’d LOVE for you to be a part of it and post these. P.S. – your photography is fantastic! These are stunning! I am adding this recipe to my “gift” recipe bag.